Eggs scrambled, fried, and whipped into omelettes. Fresh fruit drizzled with honey. Pancakes, waffles and crepes. Roasted meats ready for carving. Do you have the image in your head? 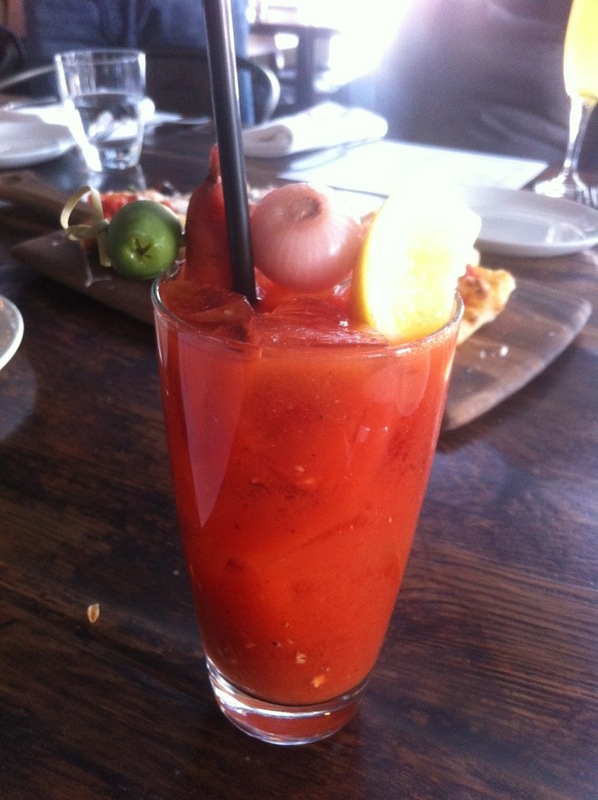 Add a Mimosa or a Bloody Mary and you have one of my most favorite meals – brunch. 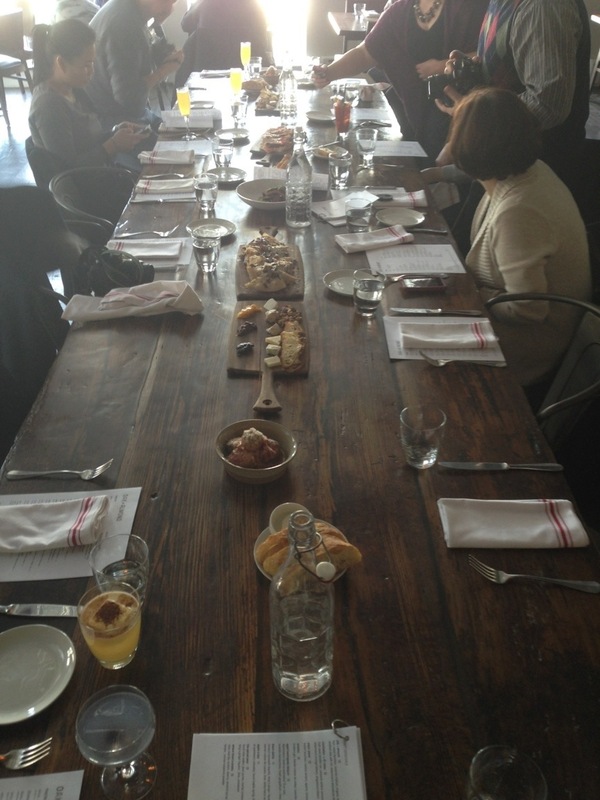 Brunch means lazy Sundays, or at least a slower Sunday, and time spent with a group of friends. 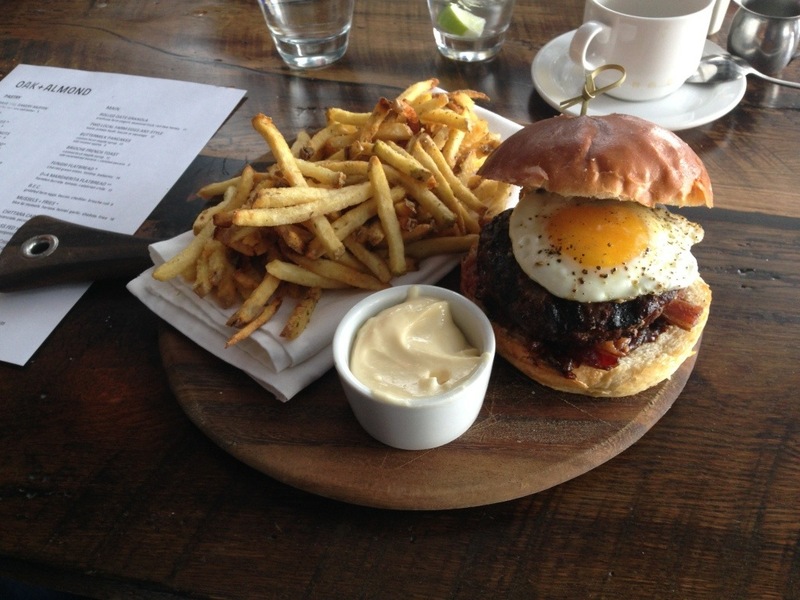 Brunch might mean recuperation from a late Saturday evening. At its most basic: Breakfast + Lunch = Brunch. Yet, if you love brunch like I do then you know it’s anything but basic. Traditionally brunch takes the form of a self-serve buffet filled with savories and sweets we all love for breakfast and lunch. Lately I’ve noticed a shift in our concept of brunch from buffets to brunch menus you order from, and while I’ll always love the concept of piling breakfast and lunch foods on my plate at a buffet brunch, I find menu brunches very appealing. Menu brunches mean you can still enjoy brunch without over-indulging and without overeating. Last week I had the opportunity to try a menu-ordered brunch – my very first – at one of the newest additions to Norwalk’s dining scene, Oak + Almond. As our group gathered around the 18 foot long communal table made from 100 year old local oak floorboards with a view of the open kitchen and a wood burning oven, I had a hunch brunch would be wonderful and someplace I’d be excited to tell you about, and I was right. 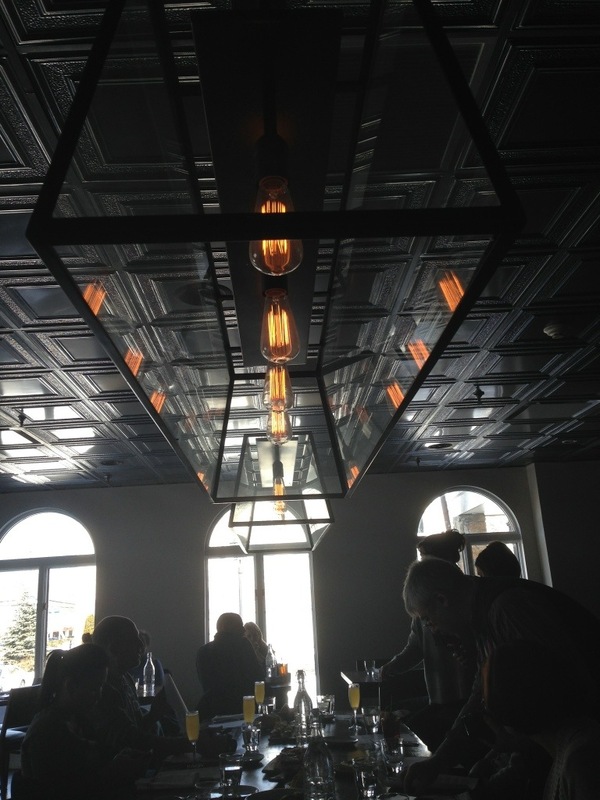 Above the communal table hang these large but sleek Edison light fixtures from a beautiful tin ceiling which will surely catch your attention as quickly as it caught mine. Aside from the 18 foot communal table that centers the main dining area, Oak + Almond offers two private dining areas, the fireplace room and the garden room, counter seating with a direct view of the kitchen and wood burning oven, a bar, and a very large outdoor patio that I cannot wait to try when the weather is warmer. 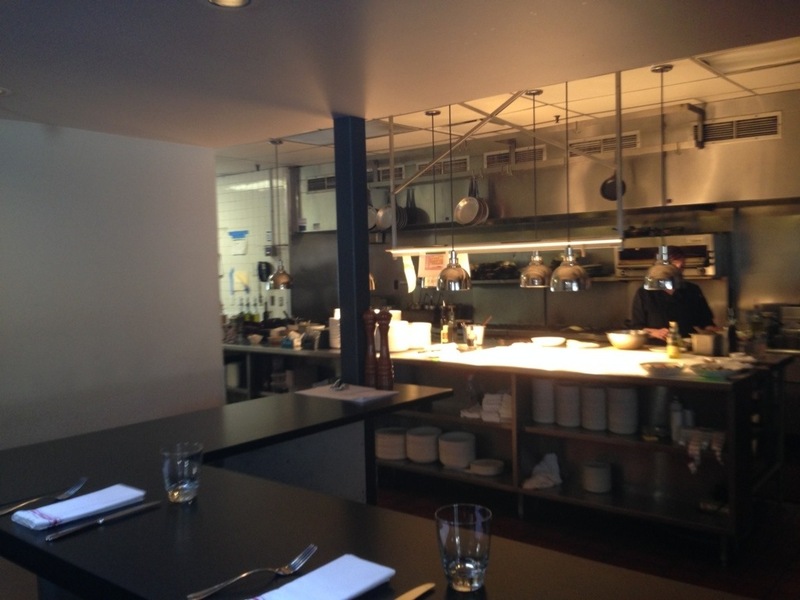 The view of the kitchen from our table and the entrance to the private dining room. 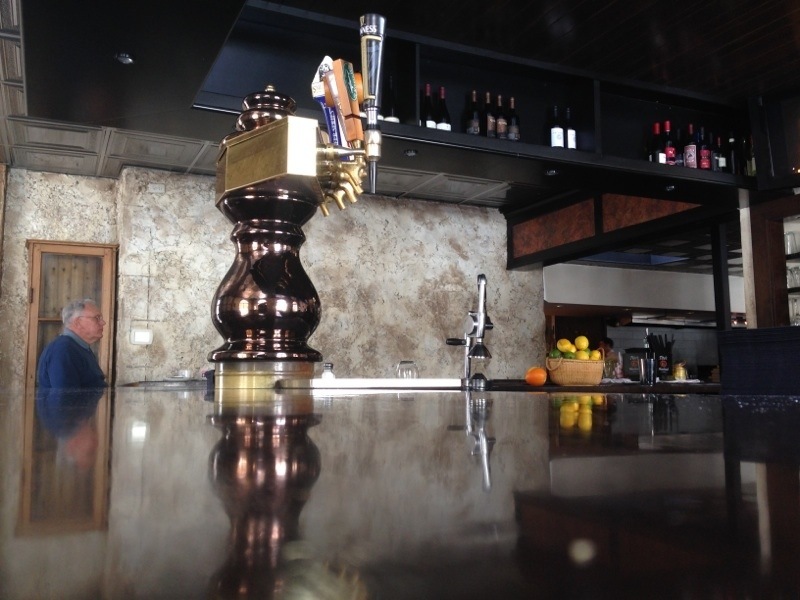 Counter seating with a front and center view of the kitchen. 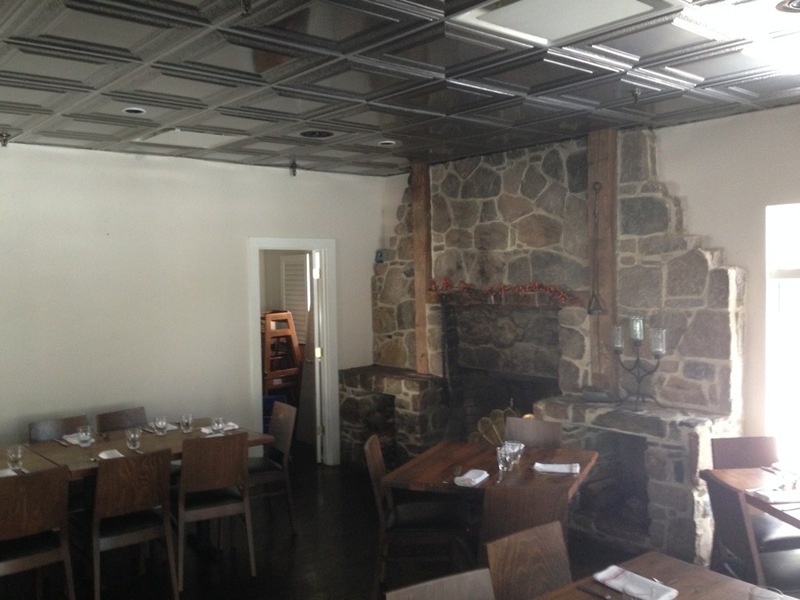 The Fireplace Room offers private dining for 25 people. 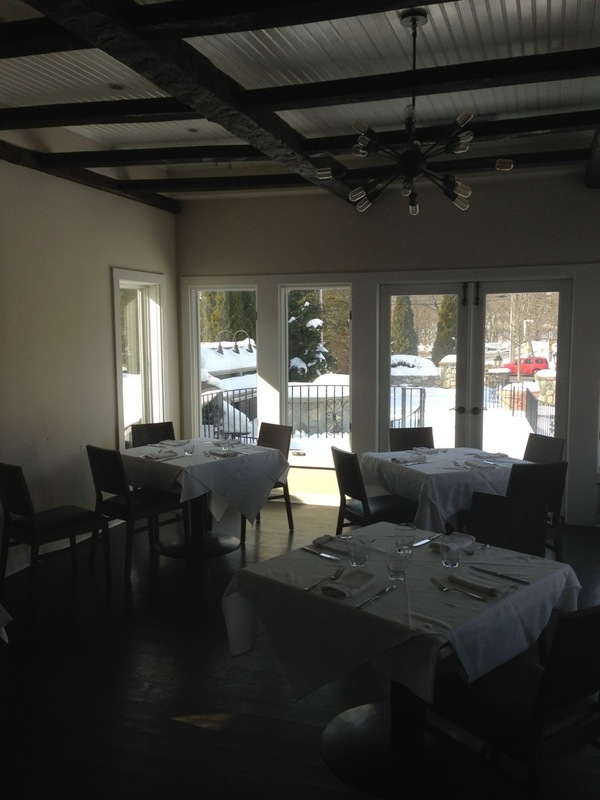 The Garden Room offers private dining for 30 people and a view of the outdoor patio. 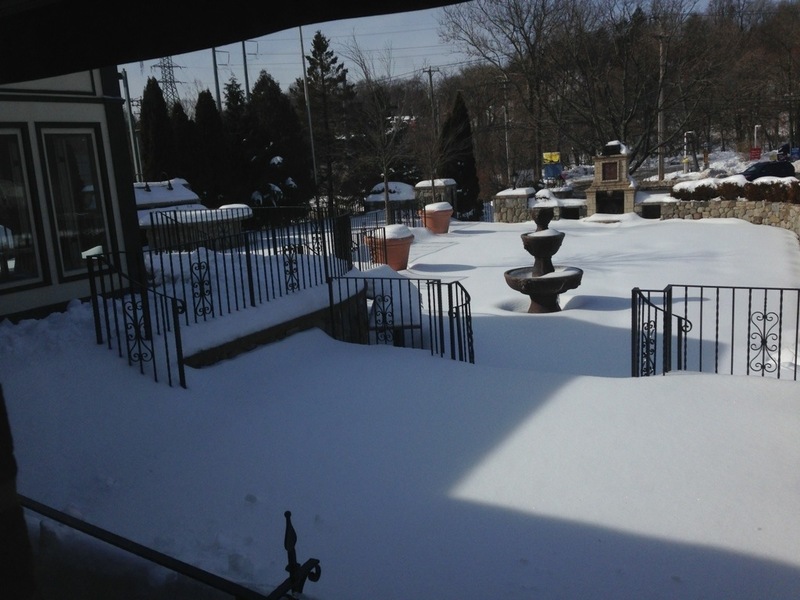 The Outdoor Patio seats 100 people and during warmer months has an outdoor bar and fireplace. For me, brunch requires mimosas in order to be, well, brunch. For others, I know a Bloody Mary fulfills the same roll. 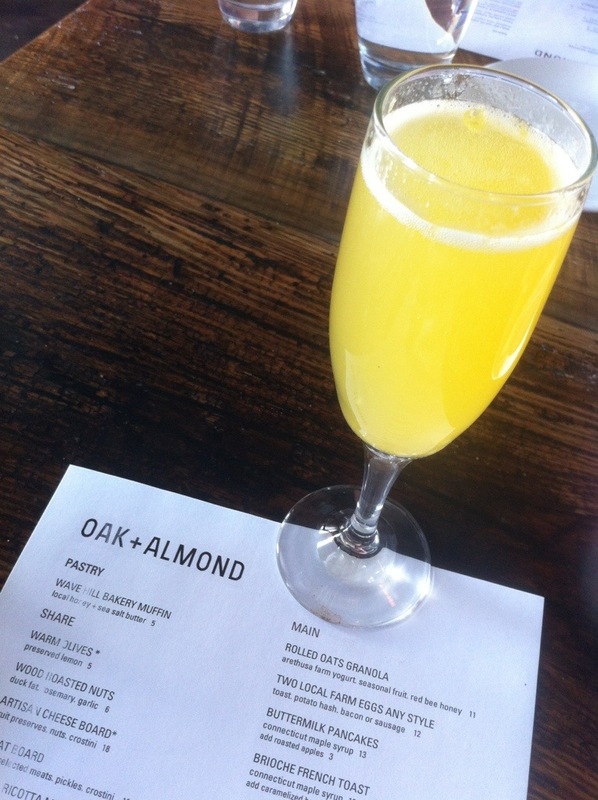 Whichever you prefer as your brunch beverage of choice, Oak + Almond has you covered. The mimosas are a glass of champagne with a splash of orange juice – the only way a mimosa should be served, I believe. The Bloody Marys satisfied my fellow diners from the drink itself to the detailed garnish added on top. 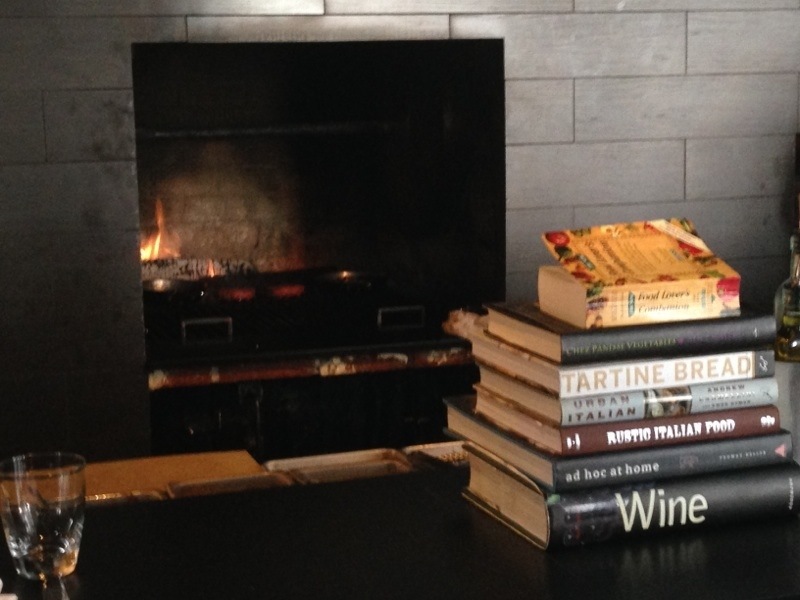 Oak + Almond’s brunch menu is extensive and offers a variety sure to appeal to anyone. 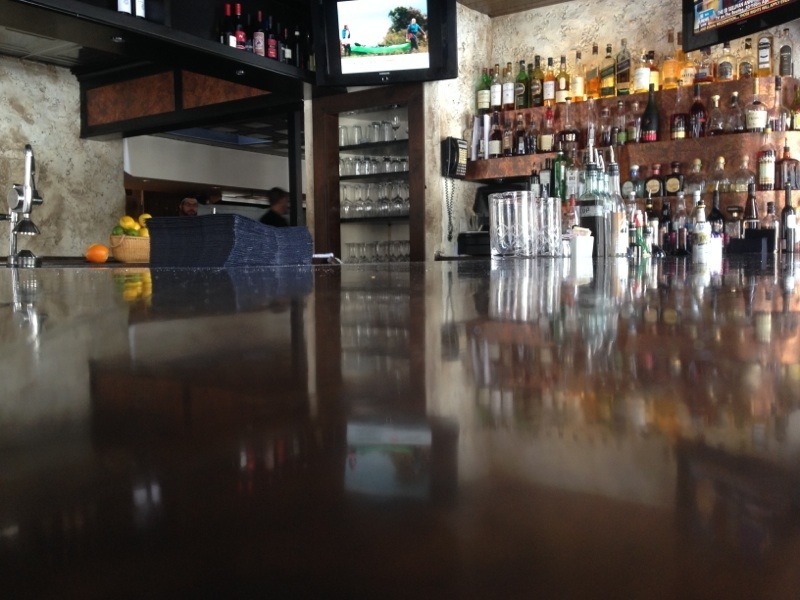 Divided into several sections – Pastry, Share, Main, and Sides – the menu includes some brunch classics such as Brioche French Toast, Buttermilk Pancakes, and local farm eggs any style with potato hash and bacon or sausage on the side, or some more unique options such as Charred Octopus, Funghi Flatbread, and Mussels + Fries. 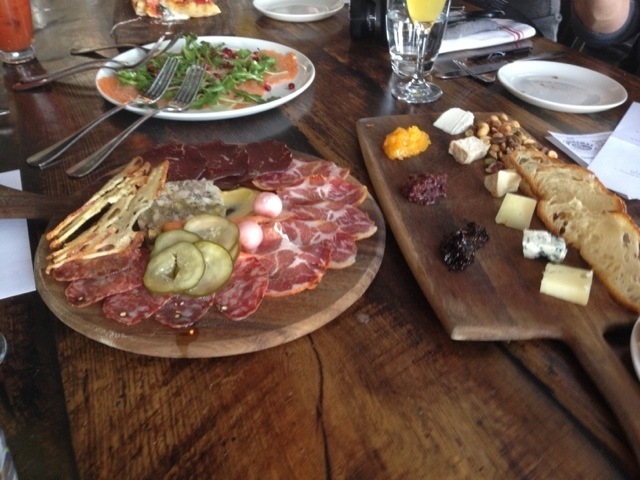 One way to experience menu-ordered brunch is to begin by sharing some small plates or appetizers before moving on to the main dishes, and that’s exactly what we did. 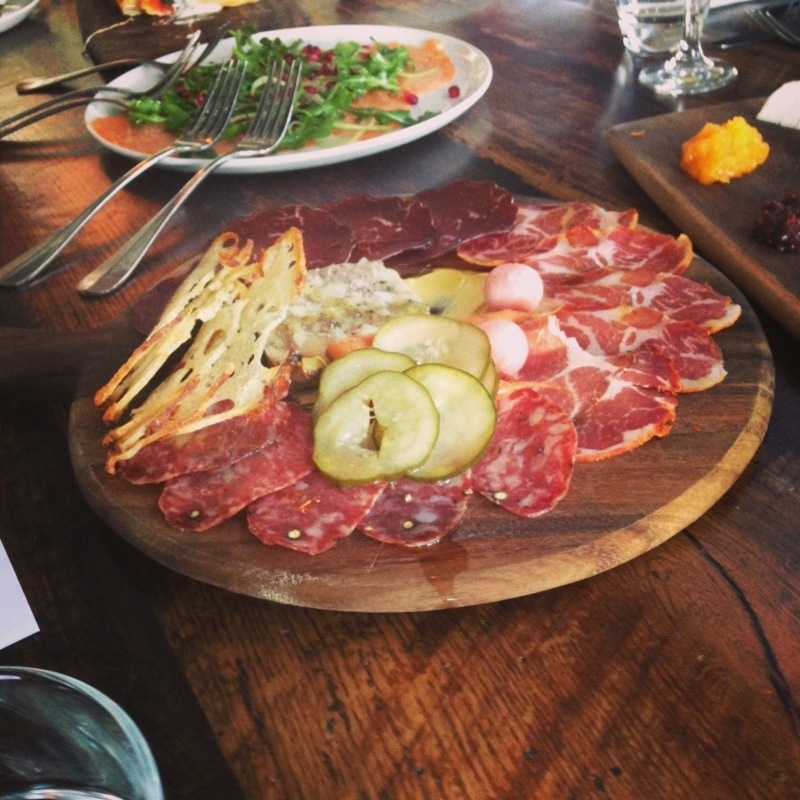 The Meat Board is made up of hand picked meats, pickles, and crostini. Some people piled some slices of meat and pickles on top of a piece of crostini, whereas others added a slice of meat and a pickle to their plate. 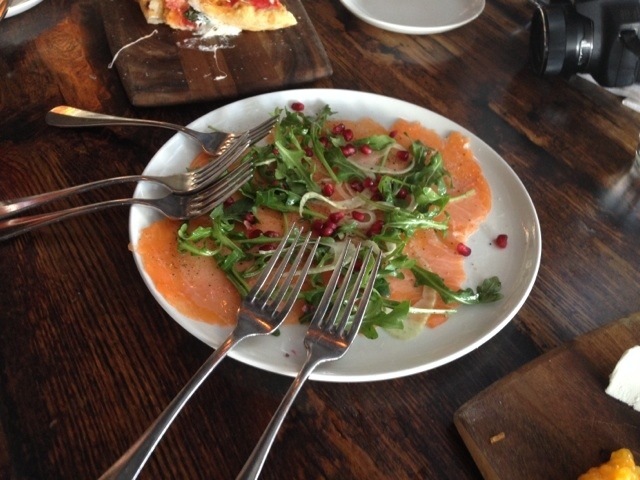 Made of the freshest salmon sliced paper thin, the Salmon Carpaccio was a hit with our group! 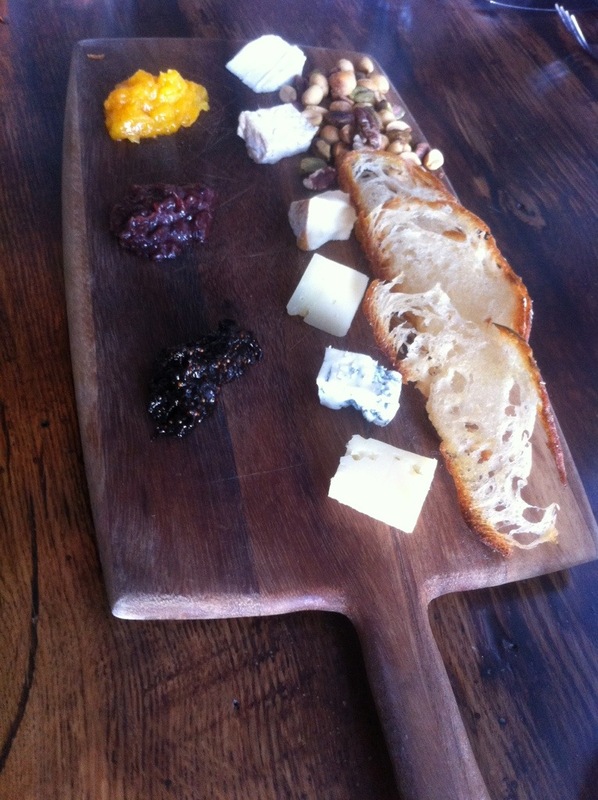 Fruit preserves, nuts, and crostini accompany an array of cheeses to make the Artisan Cheese Board. 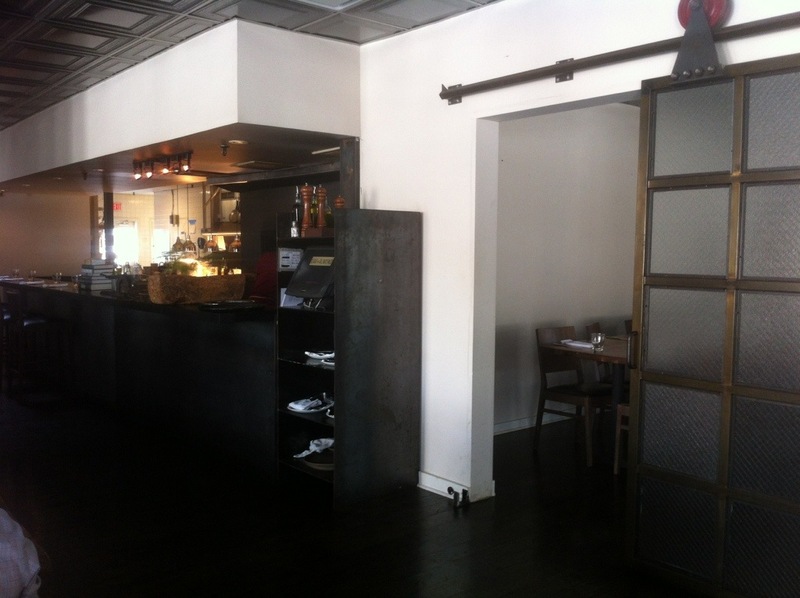 Oak + Almond offers several vegetarian options and several items on the menu which can be made vegetarian. One vegetarian dish we tried was the Funghi Flatbread. 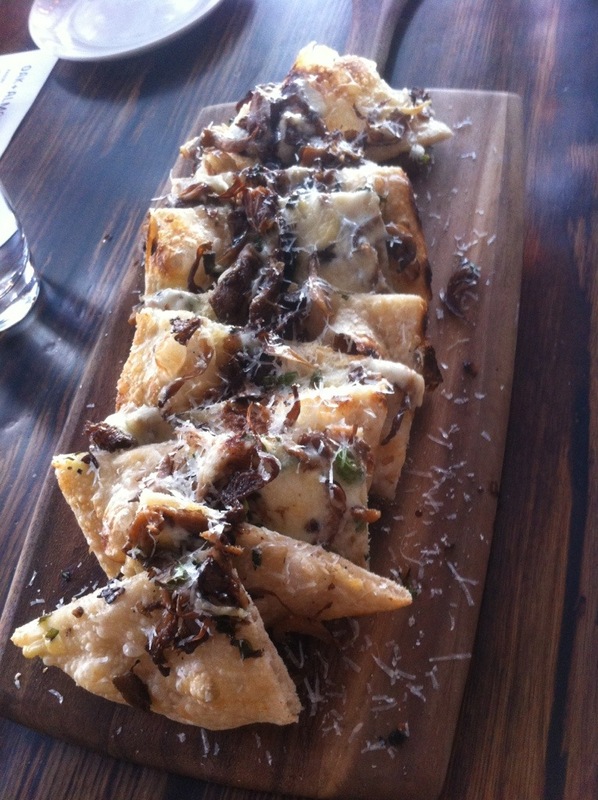 Made with mushrooms, charred green onion, fontina, and balsamic, the Funghi Flatbread was light and flavorful. The balance of the mushrooms with the onion, fontina, and balsamic make this flatbread anything but boring. 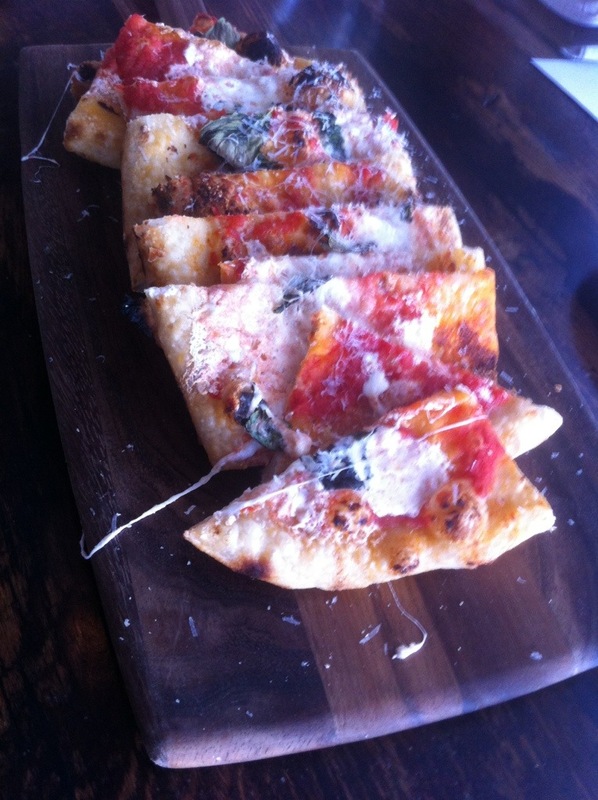 Hamden burrata, tomato, and Calabrian chile comprise this classic flatbread option. The freshness of the ingredients along with the burrata melted over the top with a stringy and gooey consistency similar to melted mozzarella but with its own flavor, makes this margherita flatbread just a little different so that it’s memorable. Meatballs seem to be a simple dish, but they really aren’t; the flavor and consistency are important and must be spot on. 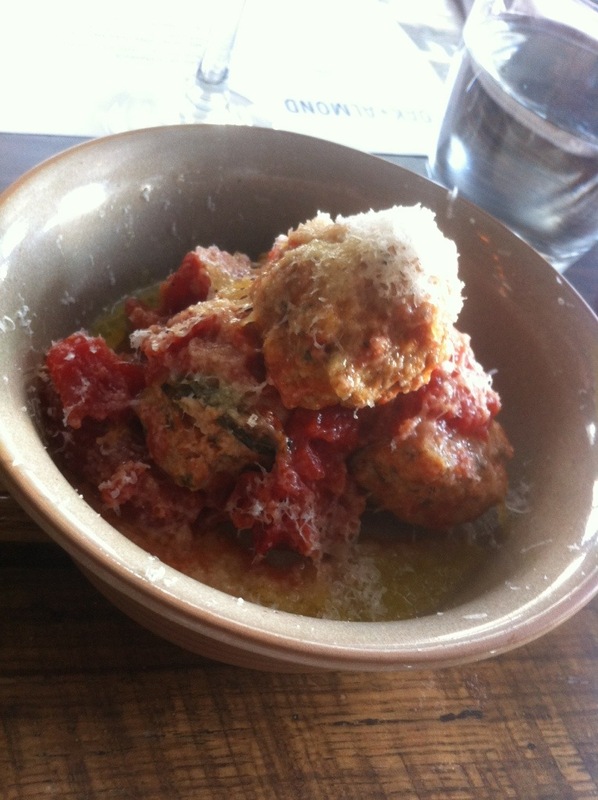 Oak + Almond’s pork and ricotta meatballs are just that – spot on! What makes these meatballs unique is that they’re made of pork creating a slightly different flavor. 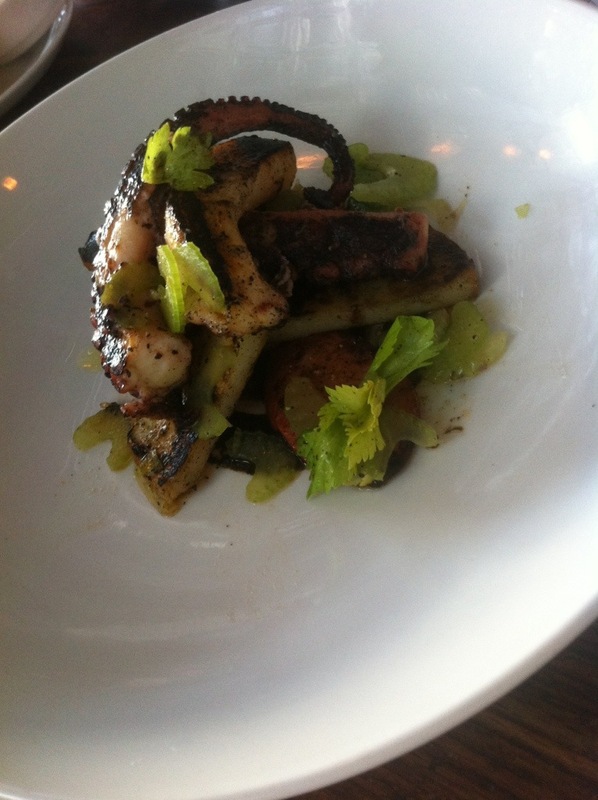 Guajillo squid ink sauce, potatoes, andouille, and celery along with the charred octopus create a very unique brunch option. The Charred Octopus and the accompanying vegetables all had a lovely charred flavor which only further accentuated the freshness of the ingredients. After we enjoyed dishes to share, each member of our group ordered an individual dish. 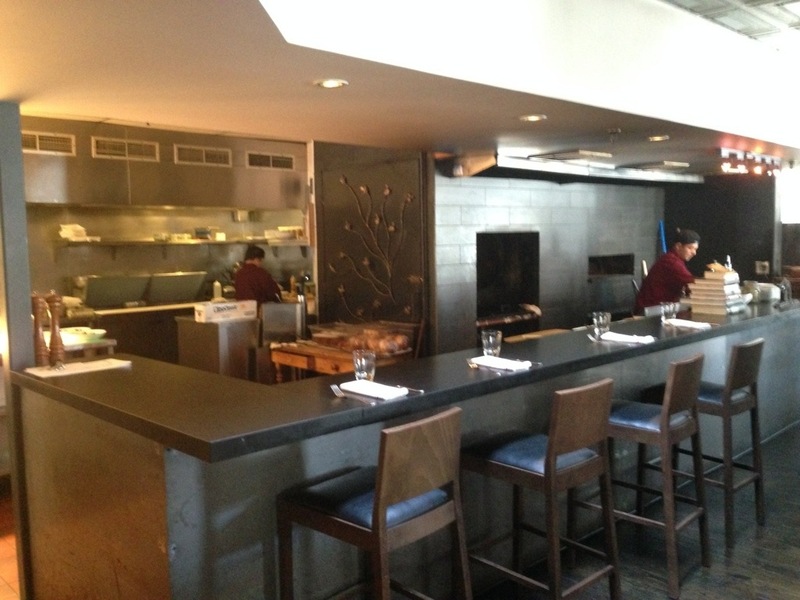 Oak +Almond’s Kitchen Sink is an ever changing salad. 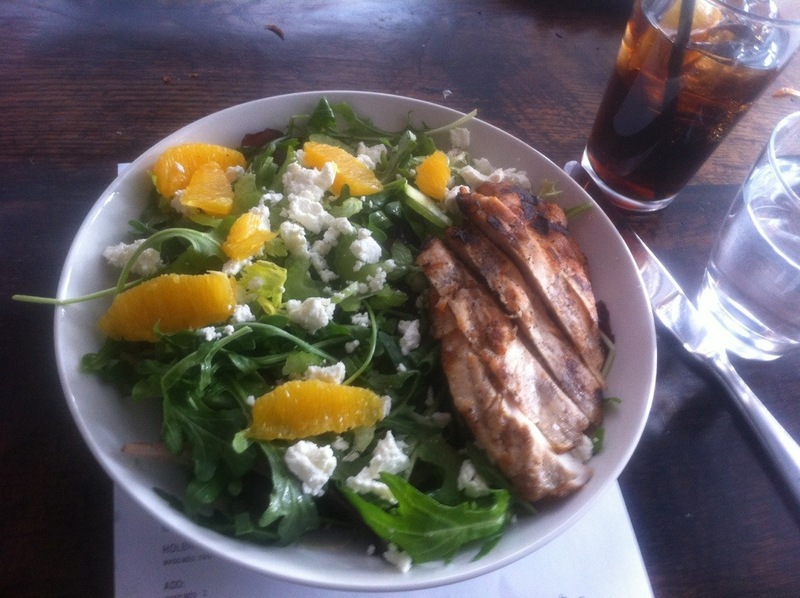 Salads also have the option to add avocado, grilled chicken or shrimp, or smoked salmon. This Kitchen Sink Salad has grilled chicken added. 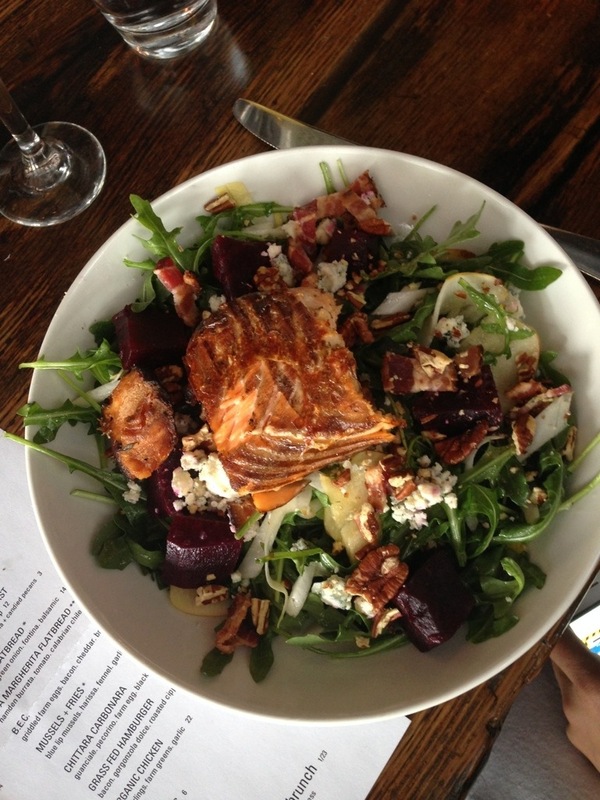 Bacon, blue cheese, apples, beets, pears, pecans, make up the Arugula + Endive Salad with smoked salmon added. 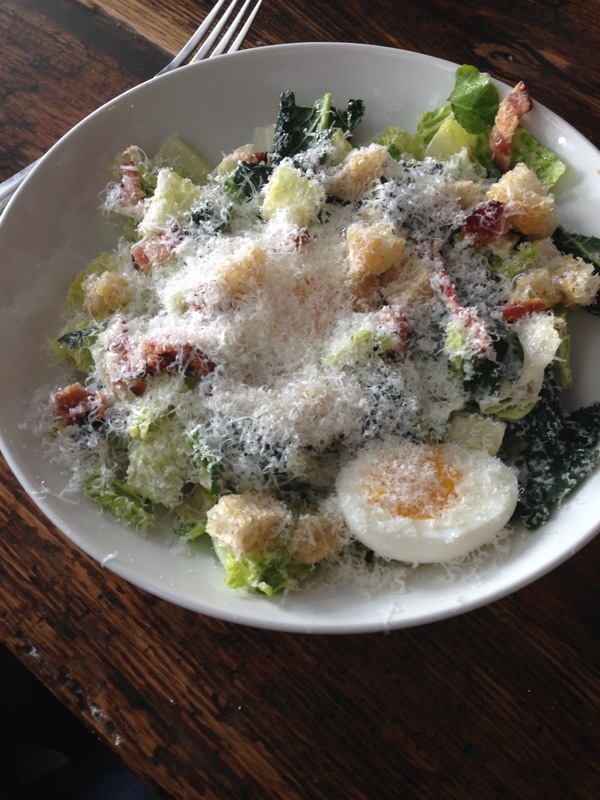 The Caesar Salad also includes a farm egg and house bacon giving it a unique twist. 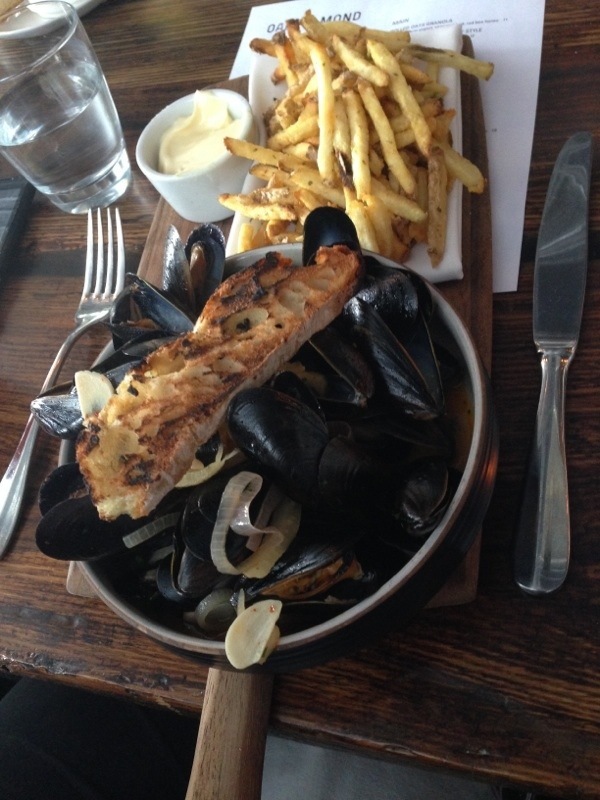 The Mussels + Fries at Oak + Almond include Blue lip mussels, Harissa, fennel, garlic, and shallots. 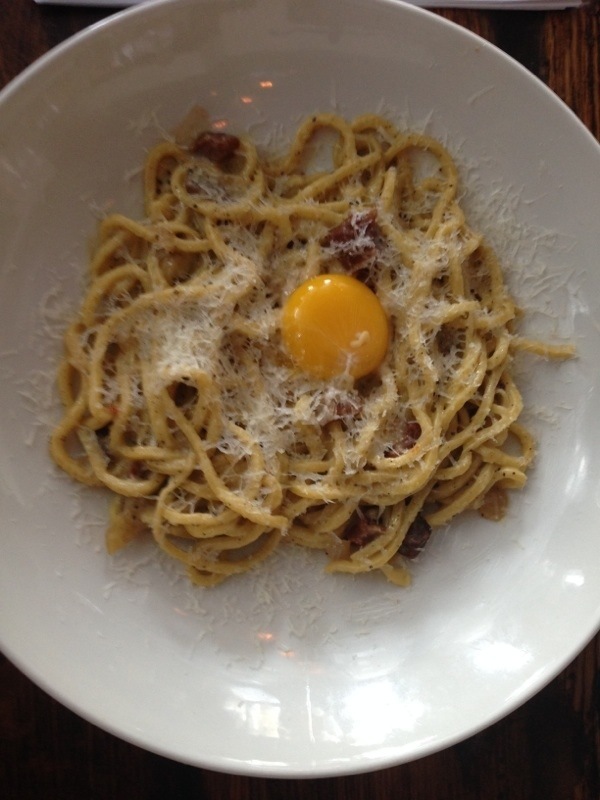 Guanciale, pecorino, a farm egg, and black pepper make up the Chittara Carbonara. 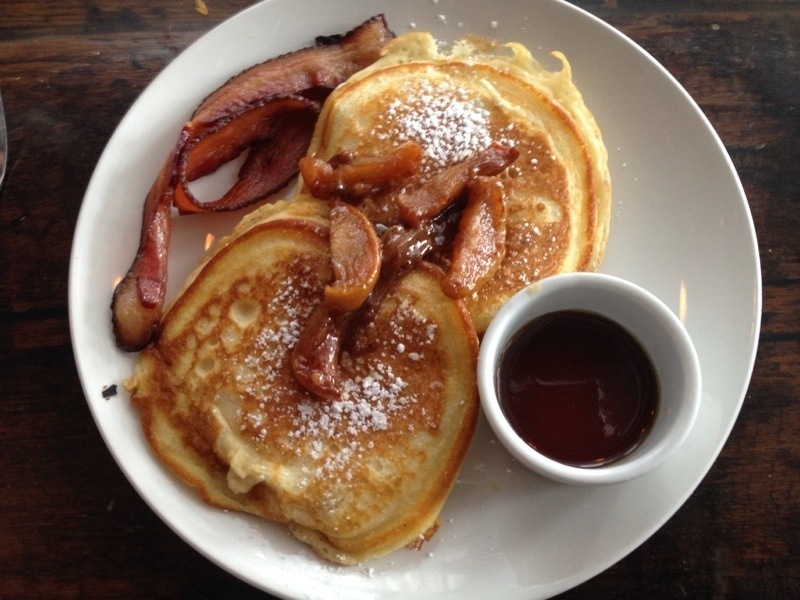 Connecticut maple syrup and a side of applewood smoked bacon accompany this light and fluffy brunch classic topped with added roasted apples. 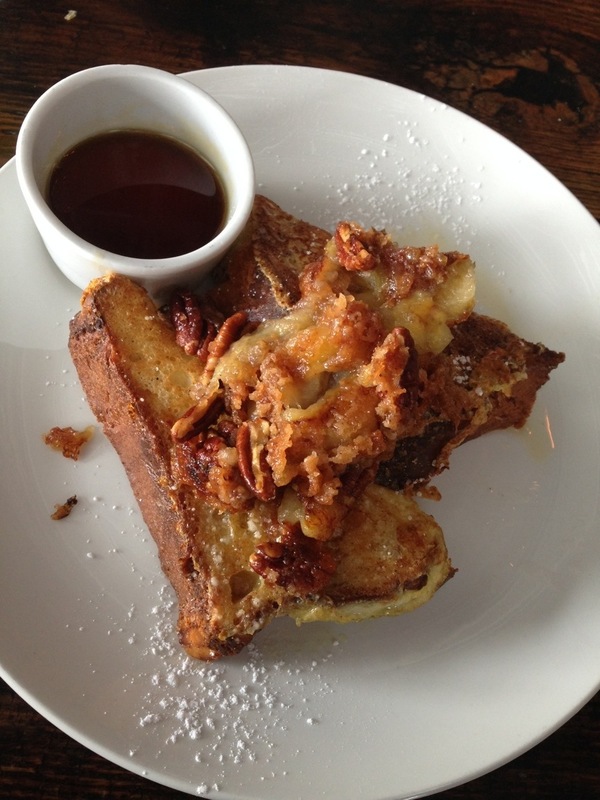 Brioche French Toast French Toast is a breakfast dish I often order and often make myself at home, so as soon as I saw the Brioche French Toast on Oak + Almond’s menu with the option to add caramelized bananas and candied pecans I knew what I was ordering. The caramelized bananas and candied pecans add some extra sweetness to the french toast as well as a different crunchy texture from the pecans. 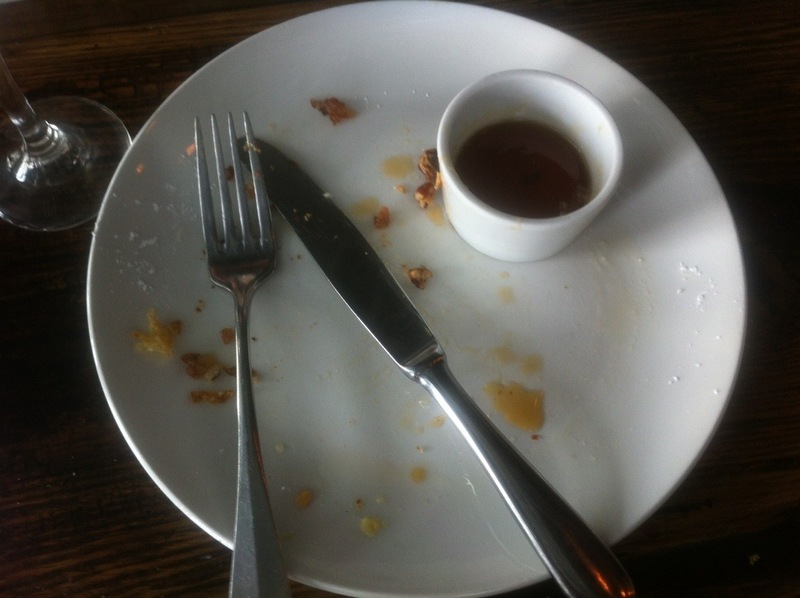 I really liked my french toast. Hello, clean plate club! 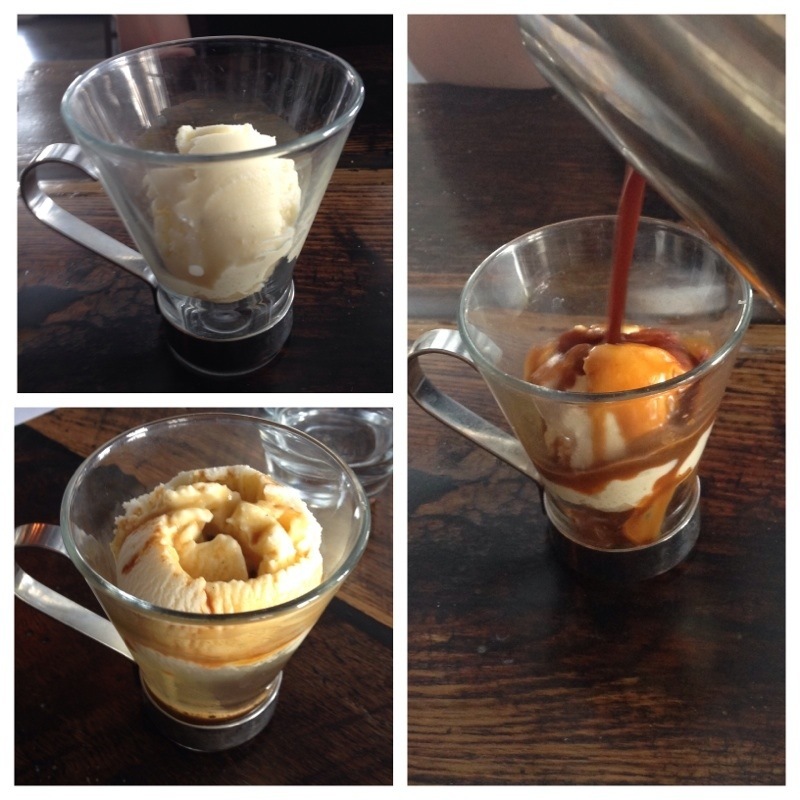 We ended brunch perfectly with affogata – a scoop of vanilla gelato with freshly brewed espresso poured over the top. 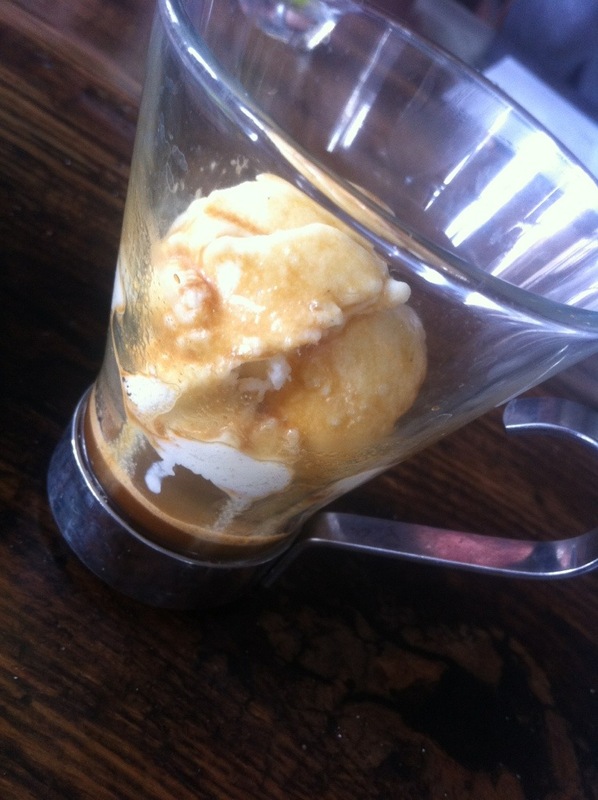 The hot espresso melts the gelato just slightly and it’s delicious. 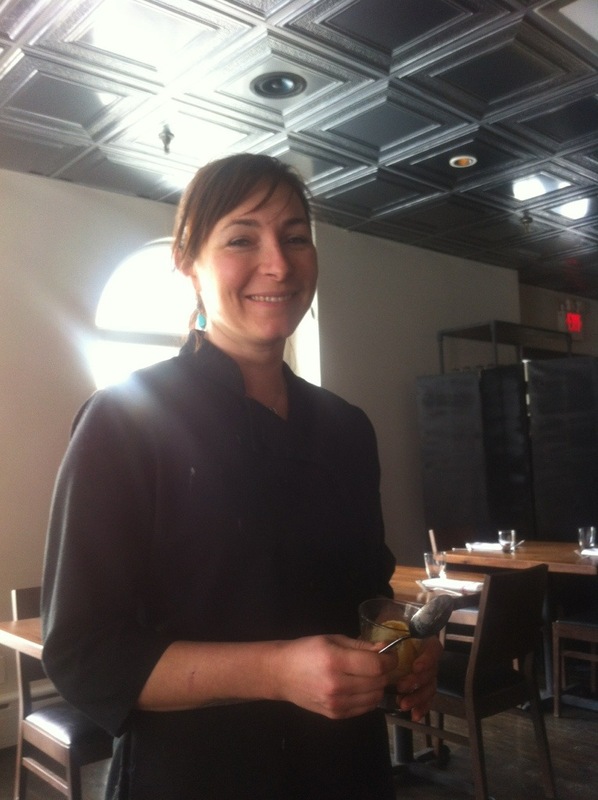 Chef Holly stopped by to say hello. 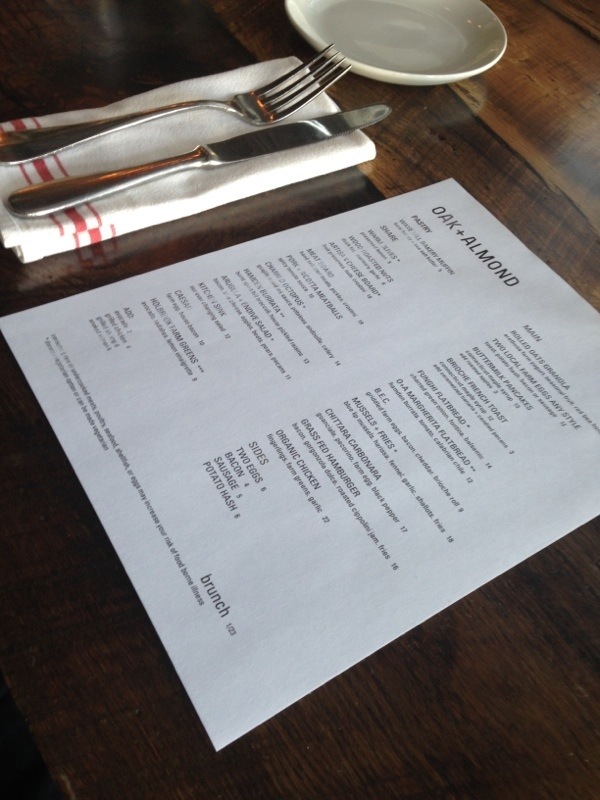 Whether you prefer to dine at the counter and observe the bustling kitchen or enjoy a more communal experience with friends, Oak + Almond’s menu-ordered brunch offers both unique and traditional options in a comfortable space which truly makes this a dining experience worth having. Disclaimer: We were invited to this media event, however the opinions expressed herein are my own.